The gompa itself is a structure of stone, clay and timbers. The small community who live there bring it to life. Shashi Dhoj Tulachan accepted responsibility for the gompa from the current tulku, who has chosen not to live the life of a monk. Supported by his brother Cakra and the Chhairo gompa committee they are working to register the gompa as an NGO with the Government of Nepal, to facilitate future support. Community members of Chhairo and some residents from the neighbouring villages of Marpha and Chimang, whose families have used the gompa’s services in the past, continue to play a role in the life of the gompa, some employed in the reconstruction works. 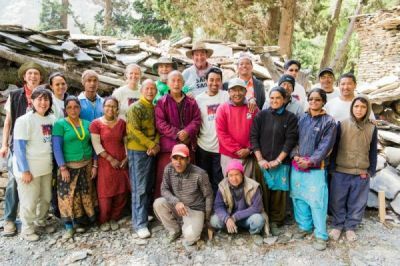 Restoration Works International with technical services from John Sanday Associates have supported the physical restoration of the gompa since 2005, and the RWI team leaders have become key members of the Chhairo community.